Certification - Does the installed cabling link comply with TIA/ISO standards? Qualification - Can the cabling link support the desired network speed or technology? Verification - Is this cable connected correctly? Also known as pair or continuity testers. Once a structured cabling system is installed, there will be a requirement to test it against a relevant industry standard. Certification is the most rigorous of all cable testing. 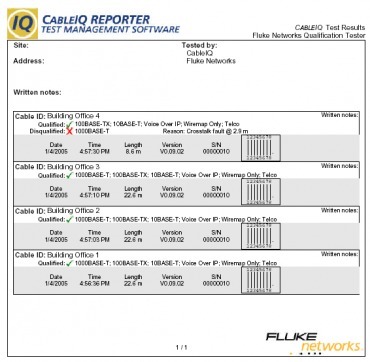 For certification we recommend the Fluke Networks DSX Cable Analyzer. Certification tools are the only tools that provide “Pass” or “Fail” information against defined limits over set frequency ranges in accordance with the detailed test procedures of industry recognized standards such as ANSI/TIA/EIA-568 or the ISO/IEC standard 11801:2002. The TIA standard defines these levels of performance in categories such as category 5, 6, 6A & 7, whereas the ISO standard defines classes of performance such as Class D, Class E and Class F, where Cat 5 and Class D represent a communication link with 100 MHz bandwidth while Cat 6 or Class E up to 250 MHz, Cat 6A up to 500MHZ and Cat7 or Class F up to 600MHz. 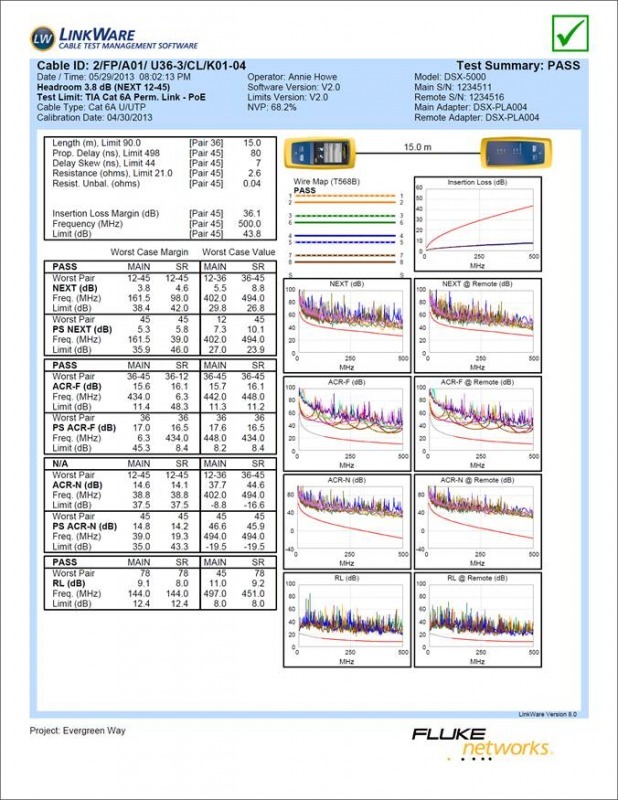 Certification also prescribes that all test results taken in the field are stored and available in print or electronic format for future inspection (see example test report to the right - click to enlarge). Qualification is a new category of testers designed to meet the emerging needs of network technicians who need to upgrade to higher network speeds as well as troubleshoot connectivity problems. Qualification testers determine if an existing cabling link can or cannot support certain network speeds and technologies (100BASE-TX, VoIP, Gigabit Ethernet) and allow the network technician to quickly isolate cabling problems from network problems. See example test report to the right - click to enlarge. 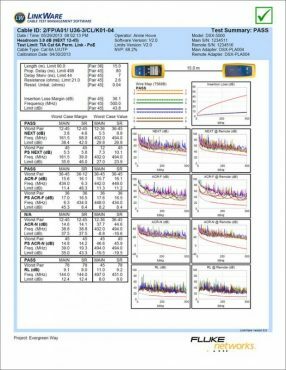 If you are a network technician, and have undocumented cabling and need to see if it will support your 1000BASE-T network, a qualification tool is the right choice. If you have an existing network and are doing small adds, moves, and changes, or you are setting up a temporary network and just need to qualify it for a specific network technology, a qualification tool is a good option. 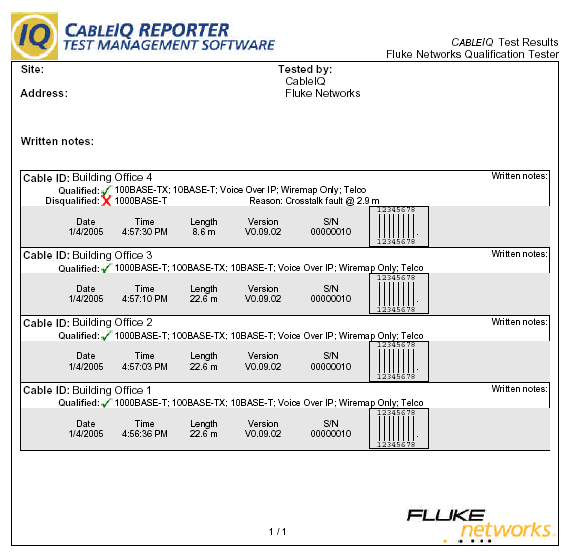 An example is the Fluke Networks CableIQ. Verification test tools perform basic continuity functions (for example wiremap & toning). These verification test tools sometimes include additional features such as a Time Domain Reflectometer (TDR) to determine the length of the cabling link or the distance to a break or a short circuit in the link-under-test. They may also detect and report that the cable under test is connected to an active device like a hub or switch. Verification tools are typically used by any technician who pulls and terminates cable or performs basic moves, adds and changes. These tools are used as a first line of defense in finding connection and wire-pairing faults. Examples are the Fluke Networks MicroScanner2, LinkSprinter and LinkRunner AT. Why not request your copy of the "Copper Testing Best Practices Pocket Guide" from Fluke Networks. Whether you handle copper infrastructure on a regular basis or just occasionally, this pocket guide will serve as a useful tool to ensure you never miss a critical step during your copper testing or troubleshooting.